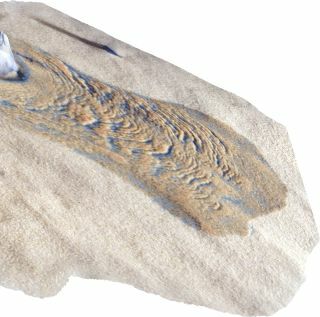 A digital model suggests how water flowing across the Martian surface could produce dark streaks as the liquid boils away. Dark streaks on Martian slopes may have been carved by boiling water, new research suggests. This finding may be good news and bad news: good, because it suggests that Mars might still have liquid water, but bad, because the planet might have less liquid water than previously thought, the researchers said. However, the impact of liquid water on Mars' current surface — and even the existence of such water — remains uncertain. The Red Planet's atmospheric pressure is too low, at about 1/100th of Earth's, for liquid water to last on the surface. In such thin air, water easily boils. "A good example is that of Mount Everest — the atmospheric pressure at the top of Everest is 400 millibars, as opposed to around 1,000 millibars at sea level, and therefore water boils at 72 degrees Celsius [161 degrees Fahrenheit] rather than 100 degrees C [212 degrees F], meaning mountaineers cannot make a decent cup of tea," study co-author Susan Conway, a planetary geomorphologist at the University of Nantes in France and France's National Center for Scientific Research, said in an email. "On the Martian surface, the pressure is 5 to 10 millibars, meaning that liquid water boils no matter what the temperature is." Previous research suggested the Martian slopes' dark streaks, — known as recurring slope lineae, or RSL — might have been caused by dust avalanches or venting of carbon dioxide gas rather than water. Now lab experiments under Martian conditions suggest that boiling water may create the strange features after all. This "Martian Chamber" at Open University in England was used to re-create the flow of water on the surface of Mars. The scientists placed a block of ice on top of a slope made of loose, fine-grained sand and watched how the resulting meltwater percolated downhill through the sand. On Mars, liquid water could be produced when ground ice or seasonal frost melts. "No one had performed such experiments before, so it was both exciting and intimidating to be able to break new ground," Conway said. The researchers had to carry out a month of discouraging failed experiments before they found a setup that worked. "It takes a lot of testing to find a setup which adequately reproduces Martian conditions, yet can be observed and measured easily," Conway said. "For example, we had the problem where the ice block we used for our source of water kept falling down the slope as it melted, destroying the features created by the seeping water. So we had to design an ice-cube safety belt, which stopped it tumbling." Under Earth-like conditions, the flowing water had little effect on the slope. However, under Mars-like conditions, with lower air pressures, the water boiled vigorously, launching sand grains airborne. The jumping grains piled up until their heaps collapsed, triggering avalanches. Water flow under terrestrial and Martian conditions in the new set of experiments. As a result, the lab slope developed small channels that were remarkably similar to those seen on Mars. This suggests that a similar process may occur on the Red Planet, Conway said. The findings also suggest that less water is needed to create features such as recurring slope lineae than previously assumed, she said. This in turn is "both good and bad news for life on Mars," Conway said. "On one side of the argument, [it's] good news, because our results show that water is still a viable candidate for forming RSL and therefore leaves the door open for the presence of liquid water at the present day," Conway said. "On the flip side, [it's] bad news, because they also show much less water is needed and that the water that is produced is very short-lived, therefore not a fabulous environment for microorganisms." One potential criticism of these experiments is that they cannot mimic Martian gravity, Conway said. Still, the research team's calculations suggest "that the boiling effects might be even more intense under Martian gravity," she said. However, "indisputable proof that this process indeed happens on the surface of Mars could only be obtained through observations or experiments performed by future explorers, or possibly rovers," she added. Future research can also investigate how the boiling effect changes with temperature and sediment type. Another question is "if there is more water, does this effect of boiling become swamped by other processes of erosion and transport? Our preliminary work suggests even more weird effects happen at higher water-flow rates," Conway said. The scientists detailed their findings online May 2 in the journal Nature Geoscience.